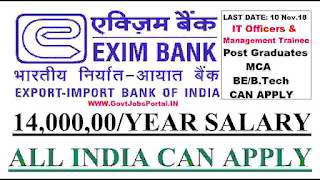 Export Import Bank of India is looking to fill up the various vacant job profiles in their banks. Export-Import Bank of India, an all-India premier financial institution engaged in financing, facilitating and promoting India’s international trade, having a network of 19 offices in India & overseas and Learning Centres in Bangalore and Ahmedabad, invites applications from fresh Indian graduates for applying this EXIM Bank recruitment process 2018. 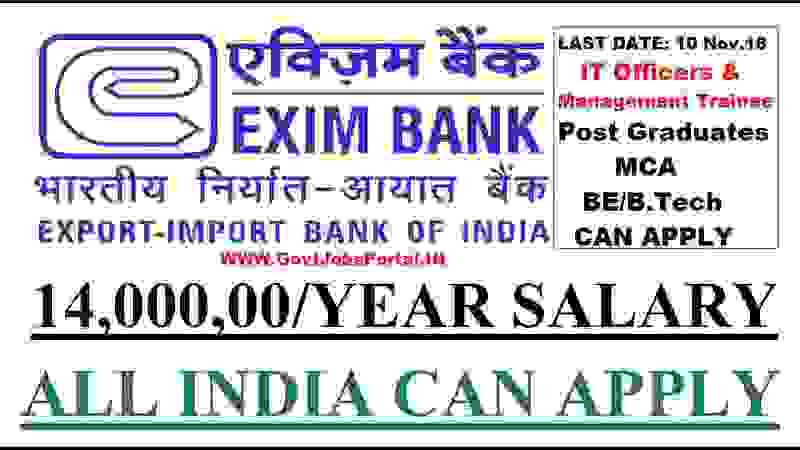 Candidates can Pay Examination fee through Online for this EXIM Bank Recruitment process 2018..
Disclaimer: We took this information from the following website: “ https://www.eximbankindia.in”. Inside this website we found two PDF files each one contains IT officers and Management Trainee detail We also share those file link under IMPORTANT LINK section. So all the rights for the above information goes to this website only.